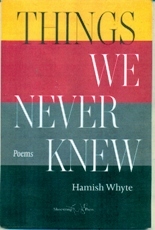 Things We Never Knew by Hamish Whyte is one of the most refreshing and clearly balanced book of poems I have read recently. He takes snapshots of everyday life – a description of a robin, dozing in the garden, a visit to his mother, the image of a girl from a train, market day in Berwick – and through the clarity of his style, brings home the very essence of these experiences to the reader. He does not rely on elaborate metaphors, potent similes, juxtapositions of language or contrived use of rhyme and metre; he just uses the simple essence of an experience expressed in simple language which makes this book so fresh and a delight to read. Whyte’s poems flow extremely naturally and (unlike some of his contemporaries perhaps? ), he does not seem to be writing to win awards so his work does not feel forced. In my view, this is poetry in its most natural and purest state. the robin’s looking out for me. today a mix of poppy bloomer and Rice Krispies. This is typical of the collection in that it is based in the experiences of everyday life, it is not rooted in ideas and so the reader relates to the culture of the poems immediately. The poem “Beyond Croy” again starts with a mundane event. When “flicking my eyes / from the whodunnit to the winter landscape”, the author sees a girl from the train who is “about twelve, dark hair tied back / dressed in black and white check jacket” and “standing alone in the middle of a snowy field / raising a hand…” There is something innocent and quite memorable in this economy of poetic visualisation: “snowy field”, “a girl about twelve”, “standing alone” all appeal directly to the reader’s senses adding conviction to the narrative content. The poem “Company” concerns a dream the poet has about visiting Edwin Morgan. In the dream Morgan is described as “chair-bound” and “entertained by two cats” and “one of them runs through his hands / like water”. The poem tells us further that “He wrote a lot about cats…Chinese cats, Russian, even Scotch / cheetikiepussies” and concludes that “It’s no surprise the pleasure he takes / in their company.” Thus the poem reverberates with an overwhelming sense of warmth towards its subject, Edwin Morgan, through dexterous simplicity of both language and style. There are a number of evocative pieces about Glasgow (the birthplace of the poet) in the collection, including “Central” about Glasgow Central railway station, “Across the Water” about “Great-grandfather Ballantine / station master at Buchanan Street”, and “The Theatre Royal’s Gorgeous Transformation to the Hall of a Thousand Lights”. The author’s Grandpa features in several poems including “Grandpa’s Boat”, “Can He Swim?”, “I Was” and “Three Taps for Charlie”. asleep with your eyes open. Having been brought up in the west coast of Scotland, where if a man cries it is often viewed as a sign of weakness, I found it heart-warming to read the poem “The Value of Tears”. The author states in the first line: “I cry more as I get older” and he relates a list of things he now cries at like “when babies are born on the telly.” or “at the finale of Beethoven’s Seventh.” Crying is an integral part of living, so I found this poem particularly refreshing in its honesty. In conclusion, Things We Never Knew, is a diverse and emotive collection of poems that translates human experience into accessible and comprehensible poetry, which is a pleasure to read. The author avoids the pitfalls of inappropriate convolution, overt intellectualism and self-indulgent posturing; and succeeds in producing a work of timeless appeal in a seemingly effortless manner. Such a tour de force is the result of his grounded simplicity in both language and style.